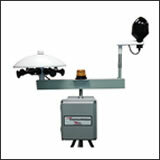 THOR GUARD offers several products to keep our customers apprised of severe weather threats. It all starts with our patented lightning prediction technology and the ability to provide audible and visible warnings through remote horns and strobe lights. Visit our Customer Orientation website for information about connecting your THOR GUARD! THOR GUARD's L75 Model is the popular choice among our customers making it the most sold lightning prediction device in the world using our proprietary atmospheric electrostatic analysis to produce a variety of lightning prediction warning levels. 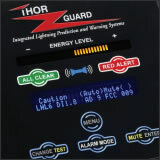 The ThorGuardian is the first, completely integrated, advance warning system for lightning. 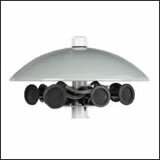 The entire package, including lightning prediction system, integrated horn cluster, and strobe light, can all be easily installed outdoors. Standard AC powered and solar powered options are available. 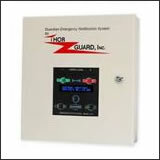 Whether it is an unexpected campus emergency or a dangerous lightning threat, THOR GUARD's GENS system can provide an affordable option for automatic warning notification. The Guardian Emergency Notification system can use notifications via horns, strobes, email, text, etc. The Voice of Thor horn system allows a base horn cluster, and/or optional remote horn cluster, to be controlled by the lightning prediction system through RF communication. Base and remote horn clusters have battery back-up with standard AC powered and solar powered options available.